We are always looking to help our Active Military, Veterans and their families anyway we can. If you have ideas or thoughts about how we can better serve our Heroes, let us know at webmaster@hamiltoncountyveterans.com. Veteran Legal Clinic - Indianapolis is starting a free, no appointment needed Veteran Legal Clinic beginning December 18, 2018 and every third (3) Tuesday of each month from 11am-4pm at the Richard L. Roudebush VA Med Ctr, 1481 W 10th St Indianapolis, In. Room C-1202. Just walk in to address your civil legal matter such as: eviction/foreclosure, child support/family law, outstanding warrants/fines, restoring driver’s licenses and discharge upgrades. Questions? Please call any of our Veterans Justice OPutreach Specialists - Judi Green 317-988-1453, Mark Mayhew 317-988-1407 or Sandy Whiteley 317-988-1406. The Veterans22.org International Food Festival will be held on Sat May 11, 2019 from 12-5 PM at the Carmel High School Football Stadium, East 136th Street & Stadium Drive, Carmel IN 46032. Your Hamilton County Veterans and your Hamilton County Veteran Service Officer will be onsite to assist you with any Military/Veteran questions/issues you may have. 22 Veterans Commit Suicide Everyday. Let's give back to those who have given their utmost for our country! Veterans 22 (Veterans22.Org) is a youth organization at Carmel High School whose goal is to build societal awareness and urgency to combat Post Traumatic Stress Disorder (PTSD). We are raising funds for veterans PTSD health care and well being programs. Come and support Veterans with Family Fun, Games and Good. Admission is Free! Please contact Veterans22.org at Renuka.Bajpai01@gmail.com If you wish to provide any form of assistance to our cause, e.g., volunteer, non-monetary donations, advise. October 23, 2018, The Hamilton County Veterans just completed another BIKES FOR HOMELESS VETERANS program to help Homeless Veterans, & those Vets in need of Transportation in order to get to work. The HCV with the help of the Noblesville Police Department collected Bicycles throughout Hamilton County. We were able to help several Veterans in need. If you still have a bike you no longer ride and would like to donate it to a Veteran in need, please contact us at president@hamiltoncountyveterans.com and we will be in touch. August 21, 2021 the Hamilton County Veterans would like to Honor our Vietnam Brothers and Sisters who so bravely fought for our Freedoms and never made it home, and we want to Welcome Home those of us who made it back by re-dedicating this Memorial in your Honor. So come on all you old farts, put your thinking caps on and come up with some ideas on what we should do to rededicate the Vietnam War Memorial. Help us Honor all our Brothers and Sisters who so proudly fought and Gave their All for our Freedoms during the Vietnam War!! 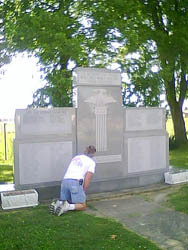 Crownland Cemetery of Noblesville - We are reconditioning and adding to the Hamilton County Veterans Memorial and NEED YOUR HELP!! We are placing 2 new Memorial Stones, one on each side of the present Memorial to add the names of our Fallen Heroes from WWI and the Persian Gulf War. The current Memorial was dedicated in 1953 with the names of the Fallen from Hamilton County during WW2. Since then, names of our fallen Heroes from Korea & Vietnam were also added. As the years have passed, the Memorial has started to lean showing gaps in the present stones which is making it unstable and unsafe. It is also needing a cleaning which we will be doing as well. We have been meeting with the Crownland Cemetery Board as well as the Hamilton County Historical Commission for the past several years but still nothing has been done. We really need the updates we have hoped for before it is too late. Honor Flight - There are two cities here in Indiana where we have an Honor Flight program. In Indianapolis we have Indy Honor Flight and in Evansville we have the Southern Indiana Honor Flight. The Honor Flight Network is an awesome time as they show our WWII, Korean War and Vietnam Veterans their Memorials in Washington D.C. If you know of any WWII Veterans or Veterans from the Korean or Vietnam Wars who are interested in making the Indy Honor Flight, please get them to fill out the Veteran Form and mail it to Indy Honor Flight Inc. - address is on the bottom of page 2 of the form or any questions, call them 317/559-1600. Also, if you or anyone you know would like to be a volunteer guardian to help us transport our Heroes, please fill out the Guardian Form and send it in - Guardians must pay for their own air fare. For those in southern Indiana go here http://honorflightsi.org/ for information.